THE NEW YORK STORIES; BUTTERFIELD 8. John O’Hara. Penguin Classics. Penguin is known for its Classics Series, and these two from John O’Hara compel in depth exploration. O’Hara was a master of the short-story form, painting paragraphs into movies. As a critic of people and society, O’Hara dug deep: digging to the core of the soul, tearing through layers of pomp and class status, unearthing the what that makes us tick. 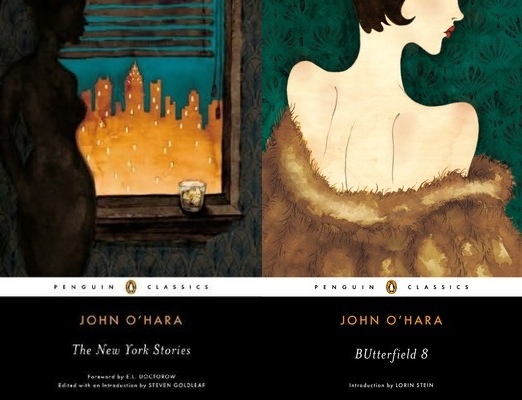 And these two books rank among his most incisive: THE NEW YORK STORIES contains over 30 short pieces set in the city of all cities, with O’Hara’s words giving form to the eyes and smells and alleys of the ultimate urban landscape. In addition, BUTTERFIELD 8 proves itself an unmatched study in character development that recalls a by-gone generation that still feels bigger than life. This entry was posted on September 3, 2013 by Jacob Aiello in 2013, In the Spotlight, Rat On Fiction & Nonfiction, September 2013 and tagged Book Review, Books.